As PR leaders continue to recruit talent from different sectors and geographies, greater resources are being devoted to better compensating current staffers, finds the PRWeek/Bloom, Gross & Associates Salary Survey. Click here to download the Salary Survey 2014 Premium Edition, which includes more than 50 pages of expanded content and data. The PR workforce is increasingly becoming populated by individuals from other industries who bring specific skills and experience. As hiring decision-makers factor that into their staffing strategies, other areas of focus include the enhancement of benefits to retain and attract talent, as well as ensuring the salaries of existing employees remain competitive. 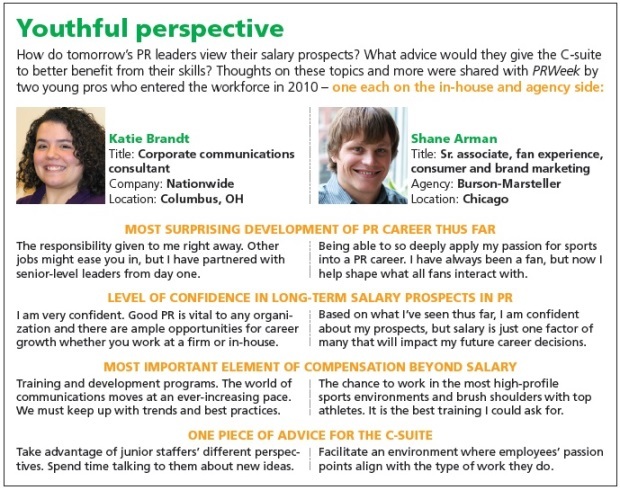 And it appears to be an opportune time to make such investments, judging from the results of the 2014 PRWeek/Bloom, Gross & Associates Salary Survey of 1,138 communications professionals across the US. An immediate takeaway is that PR pros are retaining the confident stance revealed by the previous two editions of this annual survey. Of respondents who left their companies in 2013, only 16% did so because they were laid off or downsized, down from 21% last year. Yet despite indications of more confidence, respondents also remain wary about the economy. 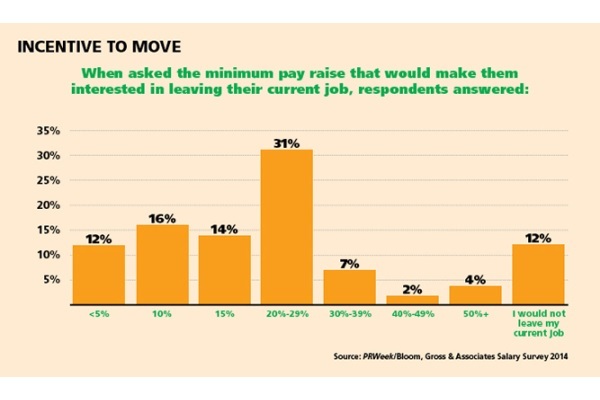 While down from 47% last year, a significant 40% said they would take a pay cut or salary freeze to ensure job security at their current company. In addition, 20% – only a percentage point down from 2013 – feel their job is under threat due to economic conditions. While financial markets gained strength last year, the federal budget impasse that shutdown government for 16 days seemed to jar the workforce. "Salaries continue to go up, but they are not taking big leaps," reports Karen Bloom, principal at Bloom, Gross & Associates, a Chicago-based recruitment firm. "Sometimes it was substantial, in other cases modest, but almost everyone we placed last year got some sort of increase." "Candidates felt more marketable and knew they could hold out for more money and for what they thought was fair," she adds. "In some ways, 2013 was a lot like 2012 – hiring activity came in fits and starts – but I did see an overall positive attitude shift in candidates." Some hiring leaders see 2014 as a unique time in the PR job market because salaries have yet to get out of hand in the fight for talent, yet the economy has improved and there are more candidates open to an employment change. Jim Finn, VP of corporate communications at Computer Sciences Corporation in Falls Church, VA, says, "There's a real opportunity now, much like there was in the wake of the dot-com bubble bursting, to bring on strong senior professionals in-house because it has been such a difficult market in the past four to five years." In December, the company hired Richard Adamonis, an almost 20-year communications pro with the New York Stock Exchange, as media relations director. He is one of a number of hires Finn plans to make this year as he builds the global IT services company's communications function with about 50 experienced practitioners. "Senior professionals who are the number one or two at their current organization are willing to consider joining my team because of the interesting things we are doing with the company's turnaround," says Finn, who specifies their salary expectations are reasonable. In addition, Finn notes that the move by some companies to combine their marketing and communications units – believing that it creates cost synergies – has in many cases challenged the PR function within the C-suite. That has led to high-ranking talent looking for positions where their skills will be valued as distinct and necessary. "There is a career path for people in communications and a career path for people in marketing," adds Finn. "It is a mistake to confuse the difference between those two functions. They don't have to be integrated, which is the Holy Grail for some companies right now." Business is up by 30% at executive recruitment firm Korn/Ferry, "which is a bit higher than we expected," says global MD Richard Marshall. Positions have opened up as a result of management changes, mergers and acquisitions, but also in large part due to a rash of chief communicator retirements. They likely would have exited sooner, but waited until financial markets had recovered, he contends. "We also have at least three clients where the incumbent plans to step down in the next three to five years, but their companies are looking to get someone in place now," adds Marshall. "That's one thing the profession has not done well – building succession plans and talent benches for this role. Seeing this planning is a positive development for the industry." On the nonprofit side, the UN Foundation made four or five new annual hires during the past couple of years as the organization expanded its number of campaign issues, says Aaron Sherinian, VP of communications and PR. The 40-person department includes teams that are focused on digital, campaign issues, media relations, corporate communications, and internal communications. The foundation now supports 17 different initiatives, including around climate control and women's health. Sherinian pursues talent that demonstrates both an understanding of traditional media, who regularly pick up The New York Times, The Wall Street Journal, or The Washington Post, but also someone who is constantly tweeting and sharing information via mobile. "I have a sign in my office that says ‘dirty digits' [to represent traditional media expertise] and ‘thick thumbs' [for mobile media]," Sherinian explains. "The people I want to hire are between those two worlds." He says the advantage of the current talent pool is that "those types of people are easy to spot as there are not a lot of them. However, we're going to start seeing more of them as training is done to develop such professionals." All decision-makers on the agency side PRWeek interviewed claim to be in hiring mode. Survey results support that, as 89% of agency respondents said they planned to increase headcount significantly or moderately. No respondent said there would be staff reductions. In the case of social media and digital specialists, agencies and corporations are taking the time and energy to identify talent who are truly qualified for their positions, particularly at a time when almost everyone seems to consider themselves a social media expert. Three out of four respondents rated their social media skills outstanding or good. A further 88% said their social media skills improved in the past year. Barri Rafferty, senior partner and CEO of North America for Ketchum, says it's a staffing area "where we often see a lot of people who are over-titled and overpaid." She adds that these young candidates quickly ascended the ranks by jumping from one company to the next, but as a result have missed picking up critical skills needed at the higher levels to flourish in the PR agency world. "The key is matching good talent at the right salary compensation, so vetting that talent has become our biggest challenge in this area," reveals Rafferty. During the past two years, Ketchum has put new candidate tests in place that measure strategic business thinking and other skills. Occasionally, potential hires are even asked to deliver a presentation. At the Los Angeles office of PMK-BNC, Rebecca Waits came on board late last year as EVP of people services, with the mandate of staffing up the firm's digital practice and cultivating its corporate culture. "One reason the agency brought me on was my digital background," says Waits, who previously held a similar role at interactive agency Rosetta Marketing. "A big part of recruiting in digital is tapping into your network." She says the challenge for PR agencies is to position themselves as an attractive employment option for digital and social media experts. "You have to tell a compelling story in terms of how their skills transform into the PR realm," she advises. Still, despite the fact PR firms are competing against different types of employers for this talent, Waits would not call it a talent war – not yet anyway. "It's not like we are consistently losing people to a particular competitor," she says, "but it will be interesting to see how social media plays out as a skill set that all kinds of companies are looking for right now." Mary Henige, director of social media, digital communications, research, and reputation strategy for General Motors, says the automaker relies heavily on agency support in this area, but she certainly recognizes the growing demand for digital and social media professionals. "My LinkedIn invitations for jobs number in the dozens each week," she reveals. "Employers need to do their homework to ensure they're getting people who do what they say they can. There is a huge difference between working on an account, leading digital business, and actually knowing how to do the work." "Digital and social media PR will continue to be a massive growth area," adds Henige. "It will also attract user-experience pros, graphic designers, Web developers, IT gurus, and marketers. As communications experts, we have to be broad minded enough to know we do not know everything and cannot do it alone in this respect." A common sentiment among those PRWeek interviewed is that hires are coming into their organizations with larger salaries than they would have received even just a year or two ago. As a result, employers are particularly focused on ensuring existing talent is competitively compensated, especially those who have been in similar positions for a number of years and may have only seen modest pay increases, if any at all. "If someone does come in a little higher than where a particular group of people are, we will look at the entire group and ponder whether or not to make adjustments," says Leah Ciappenelli, HR director at Shift Communications in Boston, who oversees all three of the firm's locations (New York and San Francisco being the other two). With the myriad promotions Ketchum made across its North American network last year, "we also saw compensation satisfaction rising in our employee surveys, which is a great sign our compensation is increasing," suggests Rafferty. "We've been able to take care of top talent by continuing to move them up." 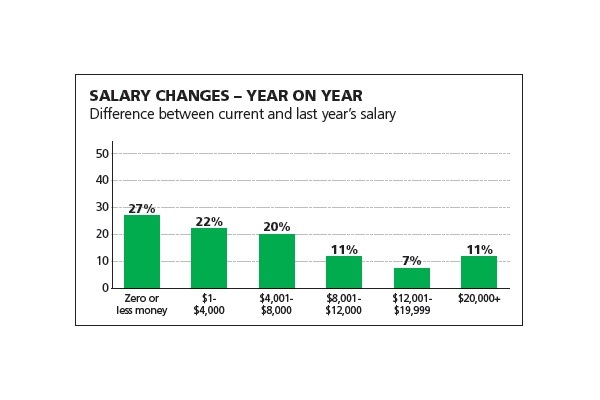 Factors beyond base salary have always been a key consideration in the compensation equation. This year is no different, as the majority of survey respondents rated perks such as a 401K and medical plans as "very important" (67% and 79%, respectively). However, the focus on improving employee benefit packages seems to be rising, both in terms of satisfying current employees and attracting new ones. Linhart PR, a 31-person shop based in Denver, is an example of a smaller agency that uses its benefits package to not only keep, but also attract staffers from outside its local talent pool. The firm does national and international work, "so we look at a national candidate pool," says Sharon Linhart, founder and managing partner of the agency. She recognizes that her firm has to offer competitive salaries, yet the agency also gives all staffers (excluding the owners) quarterly cash bonuses determined by the company's profitability. "Employees tell us that is the most popular benefit we offer. It is something that works and has been a part of our success throughout the years," adds Linhart, who notes her agency has been growing its revenues by about 10% per year. "Many of our senior people have come from other markets, worked at big multinational agencies, and bring to us best practices they have picked up." A significant segment of respondents would consider relocating. Twenty-eight percent reported being more willing to do so for a job opportunity than they were last year. And if salary concerns are an obstacle, survey results revealed a shrinking disparity in median pay between the most highly populated geographic sections of the US, with only a $10,500 difference between the lowest such region (the Southeast at $94,000) and the highest (the Northwest at $104,500). Washington, DC, which has one of the highest costs of living." Benefits that help address work-life balance have also risen in stature: 83% said personal days are important to them, while 70% said the same of flex time, a five-point in-crease from the 2013 survey. All hiring decision-makers interviewed by PRWeek recognize how important work-life balance is to the compensation package. Currently, Ogilvy Public Relations approves flexible and remote work arrangements on a case-by-case basis. But Doryse Franco, HR director for Ogilvy's New York office, says it has become such an important factor that "we are looking toward making it a more formal perk within our benefits package." "Work-life balance has been a buzzword for about a decade," she adds. "It used to be about junior folks coming in and wanting to be able to work from other locations or the Starbucks and managers having to deal with that generational difference. Now we're seeing the request for work-life balance, flexibility, and remote work from all levels, which is a real shift." "As leadership has moved away from face-time culture and recognized that people can be productive anywhere, companies have loosened the reins," adds Franco. Agencies and corporations alike are investing heavily in employee-training and career-development programs, which our survey found is important to 72% of PR pros. That number takes on more resonance as only 45% of respondents say their employers provide adequate training for them to do their jobs. "We are coming out of this hold-on-tight-to-your-budgets period and one of the first things that went when budgets were cut was the training," says PMK-BNC's Waits. "People feel more comfortable about moving now, so when it comes to their current roles, they must understand not only what that job entails now, but also what it will look like in the next 12 to 18 months." "As such," she continues, "a lot of people are asking, ‘What is the trajectory for this role?' Training has a huge role in answering that question." Shift Communications has hired a person for its HR team whose primary focus is training and development. Ciappenelli says training opportunities will be focused on three buckets: core skills, customized professional development, and informal training. Shift, for instance, offers training that helps staff transition from an account executive role to a managerial one – particularly noteworthy given the Boston office saw the biggest demand for talent at the mid-management level. And in terms of informal training, Ciappenelli says a variety of subjects will be addressed. Most recently, Shift had a lunch-and-learn session around financial planning and management for younger staff. D'Arcy Rudnay, SVP and CCO at Comcast, also has a keen appreciation of the importance of training. She oversees a 30-person team of external and internal communications staffers. Rudnay says salaries have risen in part because communication jobs have become so complex, which is why training has become such an important benefits component. "Training has become critical to our work because it has broadened in scope so much," she explains. "Professionals want to make sure they have those skills so they can command a higher salary." For all the advancements being made on other fronts, the wide gap between male and female salaries that was highlighted in this survey's previous two versions remains. Among those with five years' experience or less, median salary is very comparable, with men earning $50,500 and women $48,000. However, among those with five-plus years' experience, men's base compensation outpaces that of women, $130,000 to $95,000. Overall, the survey reveals that the median salary for men in the industry is $125,000, compared to $84,000 for women. Fortunately, some hiring chiefs who are frustrated by the gap are actively doing their part to close it. "When I hire a senior director, whether a man or woman, I make sure their salaries are comparable," asserts Rudnay. "I'm very in tune with making sure there is no gender difference between salaries." She explains the discrepancy might have to do with a failure by organizations to readjust the salaries of longtime employees, many of whom may be women, to the compensation levels of incoming talent. "It is a function of corporate America, unfortunately," says Rudnay. "It is incumbent on the manager to go back and do the salary adjustment. It's the right thing to do." Ketchum's Rafferty concurs, but believes "it will only start to balance out once we get more women in senior posts." As a member of Omnicom's Leading Women's Network, she has committed to encouraging women to strive for leadership roles. "Men continue to push harder and negotiate more than women, so I encourage women to get coaching, to negotiate, and be more proactive," Rafferty adds. "I am also seeing a higher percentage of men going into digital and social media, so I am speaking at universities and urging women to get into that side as well." When respondents were asked to rate the PR industry in terms of how well it compensates employees, 35% described it as fair, 7% as poor – a reflection that a large segment of the workforce feels they merit better pay, but also that their jobs have become more challenging. Fifty-five percent of respondents agreed to being under more pressure to perform at work than 12 months ago. To a person, every hiring decision-maker who spoke to PRWeek emphasizes the importance of gauging employee sentiment and acting accordingly to keep their own staffers satisfied when pondering various decisions related to compensation. That strategy and approach could prove to be an extremely smart and effective philosophy as the industry looks to the rest of the year and beyond, explains Bloom. "If the economy takes a nice jump in 2014, it might catch a lot of people off guard who haven't done the right planning and aren't ready for the talent war that comes as a result," she says. "Companies must pay attention. Those that do will be in the best position." 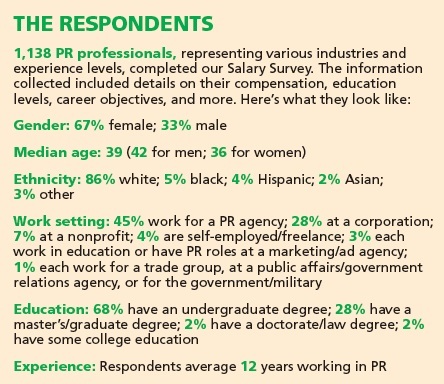 The PRWeek/Bloom, Gross & Associates 2014 Salary Survey was conducted by Bovitz Inc. Email notification was sent to 50,581 PR professionals and a survey link was posted to PRWeek's website and various social media channels. A total of 1,138 PR professionals completed the online survey between November 14 and December 12, 2013. Results are not weighted and are statistically tested at confidence levels of 90% and 95%. This article offers a summary of findings.